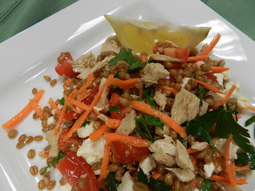 Tuna Wheat Berry Salad - A recipe from Savor California, the online showcase for extraordinary gourmet foods and beverages from California. Break tuna into chunks and place in bowl with wheat berries. Add the natural juice from the tuna can, feta, and parsley and mix gently. Add tomatoes and shredded carrot. Drizzle with lemon juice, add dressing, and season to taste with salt and pepper. Serve over salad greens or as lettuce wraps.